Die Laughing is a found footage horror that is in line with the current vogue of having films that centre around a killer taking centre stage, much like Be My Cat: A Film for Anne, Capture Kill Release and A Guidebook to Killing Your Ex. While with each subsequent release these new type of found footage loose some of their shine, as long as you have a good main lead they can still entertain. While Die Laughing did get a pass due to Bob Golub's performance I do feel that it wont be long until much like the more older style these too will start to feel stale. So Bob Golub stars as himself (and also co-wrote and co-directs), though unlike real life where he has had a successful career in both stand up and on film he instead plays a washed up comedian with a penchant for murder. Golub responds to an ad on Craigslist that was looking for someone who had killed, the poster intends to make a documentary on just what it is like to do that. However the filmmaker finds himself caught up in the goings on of Golub far more than he ever intended to. This follows closely the format that has been seen in other films though straight away it kinds of trips itself up on the whole 'found' footage aspect. This was perhaps the loosest part as it never comes across as feasible throughout Die Laughing that anything would ever have been done with the footage due to the very incriminating evidence it shows. The filmmaker is a blank slate and doesn't do much but observe for the most part. While it seemed ridiculous that even after people start getting murdered the cameraman doesn't react in any sort of sane way it did become entertaining how uninvolved he became and how he doggedly becomes a hench man of sorts for Golub. Aside from a handful of other bit-part characters this is very much a film about the fictional version of Golub and he has a very captivating screen presence. He is a no nonsense short tempered guy who takes the most smallest slight as a reason to kill, as such he is kinda wild to follow. Golub comes across as believable which is a very strong thing to do in a film such as this. He came across as so legitimate that at several points in the movie I questioned whether the people he was talking to were real unsuspecting members of the public or other actors, that even included Lacey (Sarah Rosenberg) who plays a hitch-hiker that has quite a prominent role in a section of the film. Believability is key in selling this type of horror, so the fact I was constantly wondering what was real and what was staged was pretty cool. The genius of Golub playing a character with the exact same name means that there is more scope for acting in public places, the best part being that as a legitimate stand-up comedian he can then put parts of his stage shows into the movie as if they were being done by the fake version of himself. Seeing his name up on posters, seeing him interacting with crowds of public, and seeing him in locations such as the Hoover Dam being around people all help to make this documentary seem more legitimate. It is sometimes this realism that starts to take away from the film though as while the performance of Golub is fantastic there isn't really too much that happens. This has the feel of a road trip about it with a lot of driving and talking, motel visits and misadventures, but not a lot of straight up horror. There are a variety of murders that take place, each becomes more outlandish than the last, so coming from the initial first murder we see where the victim gets their neck broken it leads up to the more silly such as a mic stand shoved up someones bottom, and a pencil jammed in someones ear. It kinda covers Golub's M.O though in that his fits of angry violence usually result in some sort of percieved twisted justice. The more mundane kills worked better for me though as with found footage it is better to have less flashy effects than over the top ones that seem at odds with the straight setting. 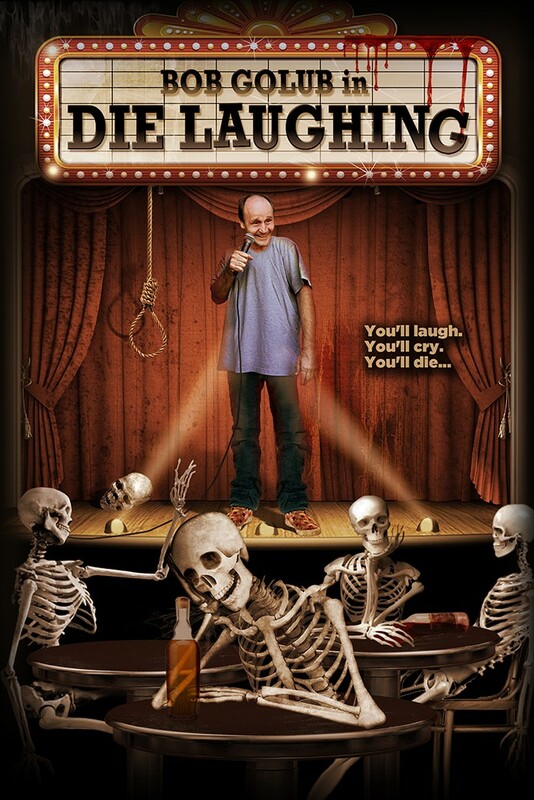 While the format is beginning to get a little stale I did enjoy my time with Die Laughing, and that is mostly down to Bob Golub and his great performance. While this is sometimes a little too formulaic and has quite a lot of uneventful moments the fact that at times it feels real (when it isn't going over the top) and is also entertaining means this is worth a watch if you're a fan of the genre. Die Laughing is now out on VOD on a variety of platforms thanks to Terror Films.